Bytemark Review 2019: Is Bytemark a Good Hosting? Bytemark is an incredibly developer-friendly hosting service based in the United Kingdom. They own and operate their own data center in York, and even developed their own cloud hosting platform in-house to ensure full transparency and reliability. Developers and agencies rejoice: Bytemark built their hosting service on supporting this demographic. 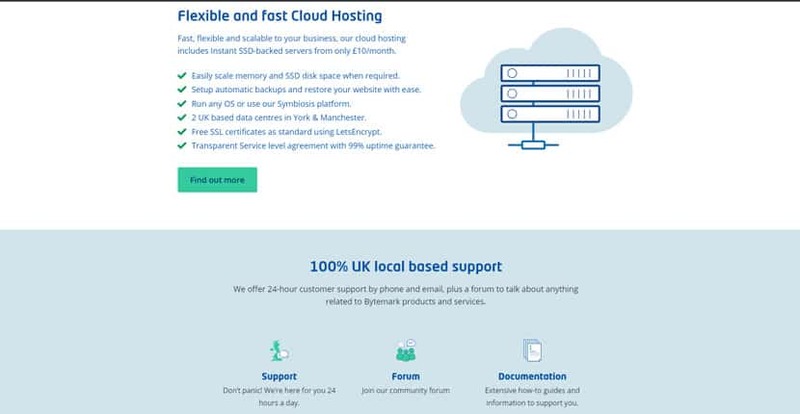 Established in 2002, this U.K.-based web hosting company owns and operates their own data center in York, developing their platforms in-house to ensure full transparency and reliability. Bytemark primarily serves a U.K. customer base, although they also have clients in other countries around the world, such as Germany, France, the United States, and Sudan. Bytemark offers managed cloud and dedicated server packages out of their two data centers in the United Kingdom. Their York-based center is entirely owned and operated by them, but they run an additional backup data center in Manchester. One of their most impressive features is that they’re ISO 27001 certified – not an easy feat for a small team like theirs. This rigorous and internationally-recognized accreditation is part of why they’re able to offer their services to U.K. government entities and healthcare facilities. Since Bytemark is developer-focused, you do need a degree of technical knowledge to make the most of their service. That said, the best platforms are also the most intuitive platforms, and Bytemark has invested quite a bit into streamlining the setup and server management process for developers. You can set up your server with Symbiosis, their simple, four-step quick start process built on Debian GNU or Linux. You get automatic daily backups, of course, but thereafter can also manage your server via their easy-to-use control panel or API. Then there’s their extensive documentation: all of the articles have been written with developers in mind, so they dive in-depth into every aspect of your server. Bytemark promises a 100% core network availability with a minimum 99% uptime guarantee. This may seem low at first glance, but consider the fact that Bytemark’s services run on a cloud infrastructure – which means it’s very likely that you’ll get 100% uptime unless something catastrophic happens. Many of their customers report that for the entire time they’ve been with Bytemark, they’ve had no unplanned downtime at all. Bytemark’s also utterly transparent about any outages and will inform their customers about any possible current or upcoming disruptions in service. Bytemark has done well in keeping their prices affordable, despite the premium nature of their hosting services. I liked that they don’t try to trick their customers with promotional prices that then increase significantly upon renewal – what you see is really what you get. That said, if you want to go with them for the long term, you get a rate reduction for a minimum two-year contract. Plus, if you’re going for their premium dedicated servers, Bytemark offers a 5% discount to authors of free software. Bytemark doesn’t have any free plans, but they do have a seven-day free trial for their cloud servers. Since most of their staff are tech geeks rather than salesmen, they’re not prone to upselling – but of course, you can choose to upgrade your free trial at any time. Their support staff are entirely U.K.-based and highly tech-savvy, which means that developers can rest assured that they won’t be talking to Level 1 Help Desk agents. You can call them during U.K. business hours from Monday to Friday, or send them an email and get a response within four hours. Unfortunately, because they’re a small team, you won’t get 24-hour support – but if you do have an emergency and need to contact them regarding a business-critical issue, you can do so via their urgent support address and get a response within an hour. The best part about Bytemark is the amount of effort they’ve invested into empowering their developers, however. If you don’t feel like contacting their support and would rather resolve the issue yourself, they’ve got a searchable knowledge base with in-depth documentation for you to do just that. Bytemark is definitely skewed towards the developer demographic, what with their discount for software authors and developer-focused documentation and all. However, if you’ve got the tech-savviness and are looking for an honest, reliable cloud hosting provider, Bytemark will still serve you well. Wondering how Bytemark stacks up against other Web Hosting companies? Enter any other Web Hosting company and we will give you a side-by-side comparison.